Your Crossword Inker cartoon has been a big hit in the world of logophiles. Can you tell us the story behind the emergence of Garson Hampfield? I live in the Canadian prairies, where if you want to go anywhere it's at least a seven-hour drive. I recall driving alone from Calgary to Saskatoon and talking to myself to stay awake. Somewhere between Oyen and Alsask, Garson came to me, fully formed...except for his accent. For a while I thought he was going to be British. Luckily, my British accent is terrible. At this time, I'd recently quit my job doing data entry for a trucking company, so I had time to work on the cartoon. If I'd been more practical I would've spent the time looking for a job instead, but for once my impracticality paid off - after the cartoon caught on, I started getting calls out of the blue from people looking to hire me. That was a new experience. Although I'm an efficient data entry clerk, the demand for my services as a typist has never been that overwhelming. Saskatoon sounded to me like the perfect fictitious hometown for Garson, but it's your true hometown, right? Can you tell us a bit about the life of a Saskatonian? When I finally came up with a voice for Garson, his accent seemed to be from somewhere in the upper midwest, maybe Wisconsin. But the dictum about writing what you know applies to animators as well, and I don't know anything about Wisconsin. When I made the sequel for Jim Horne's crossword blog, it seemed easier to just have Garson be from my own hometown. About Saskatoon. It's a pleasant little university city with a beautiful river. Compared to other towns our size, we do pretty well in terms of the local art scene, live music, decent restaurants. But in the winter it's too cold to do anything, and in summer the mosquitoes keep us locked up inside. That leaves just a few weeks in late spring and early autumn for us to enjoy all that Saskatoon has to offer, including its charming bridges. What do you think the future holds for Garson? I suppose he'll struggle along. Life is hard for an artisan in a mass-produced world. I'm a bit more comfortable with technological change than Garson is, but I can identify with his frustration. If I had my way, Garson would become the mascot for word-game addicts. Do you think he would be proud of that? Although Garson has a lot of respect for puzzlers, he'd prefer to think of himself as a visual artist. He claims to belong to what he calls the "Brotherhood of the Line", which includes Dürer, William Blake, Charles Schulz - and, of course, the great Chad Bumfry. While he's happy with the attention he's gotten from crossword fans as a result of the documentary, I imagine Garson would hate to think himself as a mascot. "Spokesman" might be more suitable, but he's not much of a talker - he likes to let his inks speak for themselves. I understand that you have quite a passion for both Scrabble and Crosswords. So you're a bit of a word buff yourself hey? Just a bit. 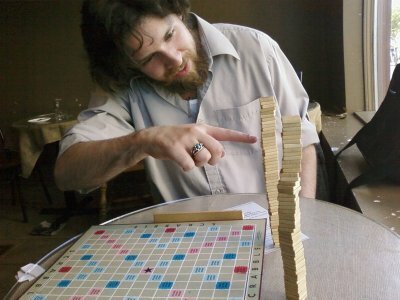 I play a lot of Scrabble but I wouldn't get very far in a tournament. I like to do crosswords when I'm traveling, but I don't get a newspaper delivered. I already have too many ways to squander my time when I'm at home. I'm currently writing a page on the Hebrew Alphabet to follow up my Greek Alphabet page. I believe you have some interesting experience of Hebrew characters and symbols? How did that come to be? You're referring to the low-budget music video my band made for our song Half My Age. Some of the characters wear masks with Hebrew characters on their foreheads. The video was inspired by the legend of the golem. In one version of the legend, the golem is awakened by carving the Hebrew word "emet", or "truth", into his forehead. To deactivate the golem you wipe out the first character, leaving "met", or "death". I should mention that my knowledge of the golem comes not from any deep study of Jewish folklore, but from a "Swamp Thing" comic book that I read when I was a little kid. Other than that, my familiarity with the Hebrew alphabet is limited to the letters that can be played in Scrabble. "Vav" sometimes comes in handy. Do you work 9-to-5 like most of us? Tell us about your day job. Lately I've been making promotional cartoons for a local internet startup called MyFrontSteps. They've been pretty cool about indulging my fondness for old jazz, crude humour, and non sequiturs. Whether these cartoons are effective qua advertisements, I'm not so sure. "Qua" is another word I picked up from Scrabble. Your band Sea Water Bliss has been described as: "More like lazy conceptual artists than an actual band". I love it! Is it accurate? For the record, I was the one that described us that way. Is it accurate? Well, I'm not sure exactly what an "actual" band would be, but except for maybe a brief stretch in 2002-03, I'm pretty sure we've never qualified. We're more like basement hobbyists who happen to have put on a rock opera. As for being "conceptual artists", I suppose I was just using the label to excuse our inability to attract an audience. It seems like the best justification for having made an unwatchable movie, or an unreadable poem, or an unlistenable song, is that you were making "art". However, it only works if you can sustain the ruse by implying, or outright asserting, that your work of art has some deeper meaning. I think with our music the lack of deeper meaning is pretty obvious. Your band's site is starting to get more publicity for your animation work than for your music. Is that a good thing? I'm always happy to have people drop by, for whatever reason. I've still got a closetful of copies of our debut CD, and if I can unload them all on my newfound animation fans, that's great. Sometimes I get a little jealous, though. I'm pretty sure if Garson Hampfield were to go on tour, he'd draw much bigger audiences than Sea Water Bliss ever would. Thanks so much Michael. I really appreciate you taking the time to do this interview. I have a feeling next time we talk, your name will be considerably more widely known. Thanks, Derek. It's been fun.